This Southern classic is delicious and works for any meal of the day. Serve it with a breakfast of grits and eggs or a dinner of mashed potatoes and gravy. If you don’t have buttermilk, just add a half tablespoon of vinegar to ordinary milk and let it sit for a few minutes. Preheat oven to 350°F. Pour half of the oil into a shallow baking dish and use a paper towel to smear the oil all over the bottom of the pan and a little bit on the corners of the pan, too. Put the pan in the oven to heat. Next, slice your tomatoes into 1/4 inch slices and lay on a paper towel or cookie rack. Use a whisk to mix your dry ingredients in one bowl and your wet in another. After taking out your hot pan, dip each tomato in the wet ingredients first, then into the dry. 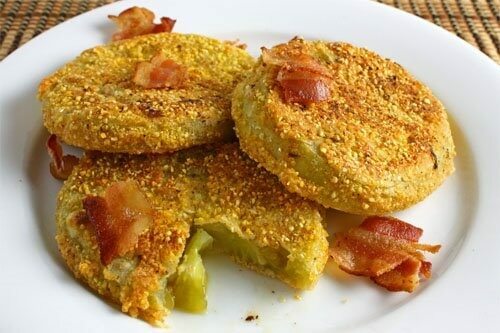 Coat both sides and the edges genroudly with the flour-cornmeal mix and lay the tomato in the hot pan. Line the bottom of the pan with tomatoes. It is okay if they touch a little. Put your each batch of tomatoes in for thirty minutes, flipping them over with a fork halfway through the cooking. It may take a couple of batches to finish all four tomatoes, depending on the size of your pan. They should be golden brown and crisp when they are ready. Serve hot with ketchup, hot sauce or even topped with a slice of cheddar cheese.